HAVE you got Victoria Falls on your bucket list yet? If not, it is a destination holiday that you would want to not only pencil in; but move to the very top of your list of places to experience – to awaken all your senses. From tasting the local African cuisine, smelling and feeling the spray from Victoria Falls’ famous waterfall, listening to the sounds of the African wildlife at night… you would want to drink in every little bit of this must-do holiday destination. But don’t take our word for it, just look at what CNN Travel, Getaway and others had to say about this magical destination. CNN Travel has consistently placed Victoria Falls on their list of 25 of Africa’s most amazing places to visit. Not only is Victoria Falls famous for being one of the Seven Natural Wonders of the World, CNN Travel described it as one of the most inspiring, and inspired, destinations on the planet. Victoria Falls is well-known for its majestic water spectacle – the waterfall is classified as the largest sheet of falling water in the world. At 108 metres high and spanning nearly two kilometres wide, The Falls recorded a flow of 12,800 cubic meters per second – double that of North America’s Niagara Falls highest flow. Victoria Falls is roughly twice the height of Niagara Falls and famous for the sheer volume of water falling into the Zambezi River. The spray from The Falls typically rises to a height of over 400 metres, sometimes even twice as high, and is visible up to 48 km away. 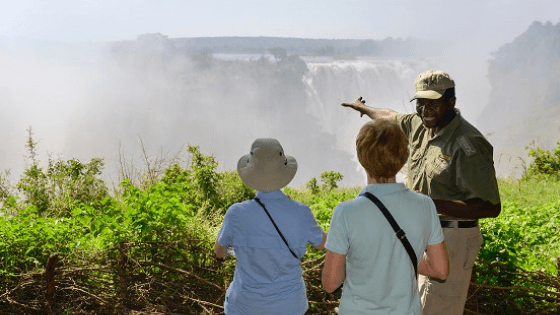 Making the list of the top 9 African travel experiences on your bucket list by Getaway, Victoria Falls’ adventure activities are rated amongst the best on the continent. Known as the Adrenalin Capital of Africa, Victoria Falls is a hub of adventure activities – from white-water rafting on the mighty Zambezi River, zip-lining, bungee jumping, canopy tours, helicopter flips and more. For the courageous traveller, a swim in Devil’s Pool at Victoria Falls is rated as one of the “top African Experiences You Need to Have Before You Die”. Devil’s Pool is a seasonal pool on the edge of Victoria Falls. Visitors can swim out to the pool on guided tours, from the month of August until later in the year, sometimes even into January, depending on the water levels of the Zambezi River. The view is guaranteed to take your breath away… and that of your family and friends when you show them your Devil’s Pool selfie – the ultimate brag picture for your collection. While Victoria Falls is a thrill-seekers paradise, it also offers a perfect location to unwind and appreciate some of the incredible wildlife that the continent is famous for. Victoria Falls River Lodge offers luxurious, bespoke accommodation options each affording incredible views of the wildlife in their natural habitat – the mighty Zambezi River, a stone’s throw away from your bed or lounge chair. For the traveller preferring slower-paced leisure activities, the lodge has plenty on offer including hiking, safari’s, river cruises, fishing and spa treatments. Victoria Falls town, a short drive from the lodge, is also a great place to explore. But whatever you choose to do during your visit to Victoria Falls, do go see the waterfalls. Many famous landmarks can stir up a feeling of awe when you see them for the first time, but Victoria Falls has an added African mystique. The deafening roar and sheer magnitude of the thundering mass of water will awaken all your senses – and remain ingrained in your memory as a place that indeed earned the description: “scenes so lovely must have been gazed upon by angels in their flight” (David Livingstone). The town Victoria Falls is located in Zimbabwe, and is the gateway to visit the famous waterfalls – with which it shares a name.